Checking or changing your air filter is a pretty easy task and also another job your bike will benefit from. There is one hard part though, removing your gas tank. It is possible to check or change your air filter without completely removing your gas tank but you risk either damaging the tank or straining a friendship. I, on the other hand, prefer to take the safe route and remove the tank (please see my Tank Off! 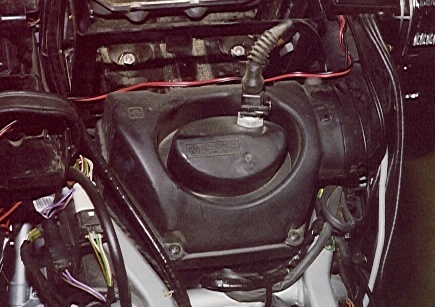 article) Seeing as how the tank is going to be off anyway, this would be a good time to service the battery as well (please see my Check That Battery Level article). Air filter cover, note the two visible screws in the back of the cover. Your air filter is housed in the black plastic lump behind the battery. It's a little easier to remove the air filter cover with the battery out but is also quite possible to remove the cover with the battery in place. 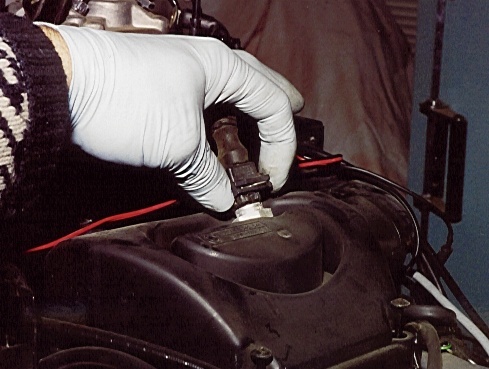 To remove the air filter cover, start by unplugging the sensor plug on top by squeezing the wire clip to the plug body and wiggling the plug off. Using a phillips screwdriver, remove all four screws holding the cover on (two at the front between the cover and battery, and two at the rear). With the screws out, lift the cover straight up and away. The air filter will now be visible. Squeezing the clip while wiggling off the plug. When you lift out the air filter, try not to bump it about too much as it will start dropping bits of collected dirt. After the airfilter is out, give it a general look over. If you are not convinced it's very dirty, spread the filter segments and look right down inside. I'm betting you'll be surprised at how much dirt you'll find. Wheather you opt to clean your air filter or put in a new one, make sure you clean out the filter box before you put the filter back in (I use a small shop vacuum). 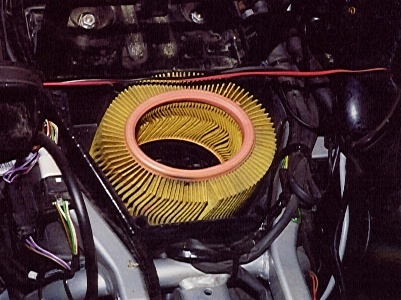 Cover off, the air filter is visible. If you opt to fit one of those "cleanable" filters, don't forget that they need to be serviced (washed out and re-oiled) on a regular basis as well. To fit a cleanable filter then forget about it will cost you even more dearly down the road than just continuing to run a dirty stock filter. Keep track of the last time you checked your filter and don't keep putting off its regular service. On that note, I'll get off my soap box. 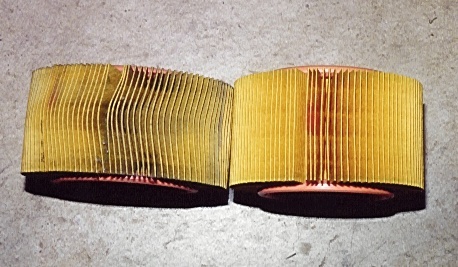 The filter on the left has 10,000 miles while the filter on the right is new. After making sure the air box is clean, press the new filter over its mount (now looking rather oval-shaped). Press on the air box top and snug down all four screws. Don't forget to plug the sensor back in and re-fit the gas tank. You will now reap the benefits of a clean-breathing intake system.